Hey everyone. Tonight I'm bringing you details about Ulta3's latest nail product release, called the Big Book of Nails - your guide of four easy nail art looks. First up, just a little recap for my non-Aussie readers. Ulta3 is Australia's top selling nail polish brand. It sells for $2 a bottle, comes in a huge range of colours and finishes and is really exceptional quality for the price. It's sold at supermarkets and chemists/drug stores and can be a bit of pot luck as to what you will find in stock at your local store. Here is the big book of nails, the front of the box and the back of the box. Open up the big book of nails and you will find 16 bottles of Ulta3 polish and four easily explained nail art tutorials. My only complaint is the photoshopped hand on each of the tutorial pictures. It's the exact same hand photo on each, with the nail art photo shopped onto each nail. I'd much rather see real nails with real examples of the nail art. 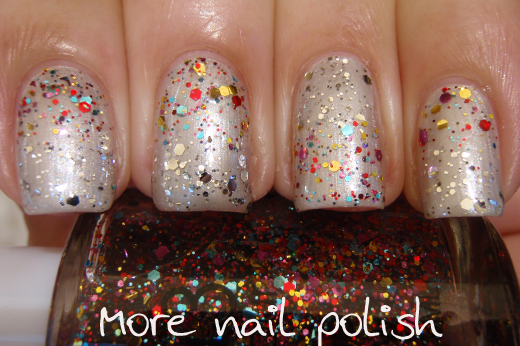 But hey, that's what I'm here for, to show you real swatches of their nail art tutorials. Bottom row: over the rainbow, twinkle toes, gold rush fever, silver grey. The other thing Ulta3 has released at the same time as the big book of nails is this nail art tool kit. The kit comes with a double sided dotting tool, a fine nail art brush, a couple of nail art sponges for creating gradients and a round metal plate for putting your polish on during your nail art adventures. 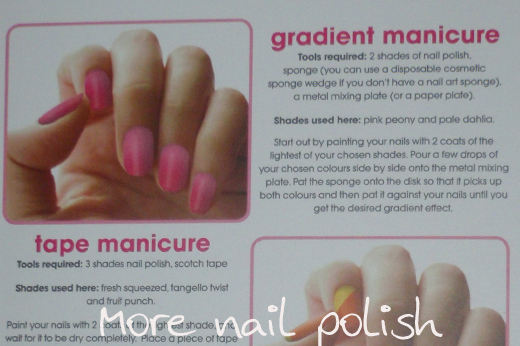 Lets start with the first tutorial - Gradient manicure. Here is the tutorial provided on the box. 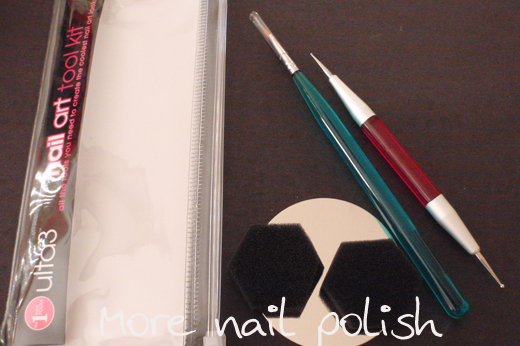 "Tools required: 2 shades of nail polish, sponge (you can use a disposable cosmetic sponge wedge if you don't have a nail art sponge), a metal mixing plate (or a paper plate). Shades used here: pink peony and pale dahlia. 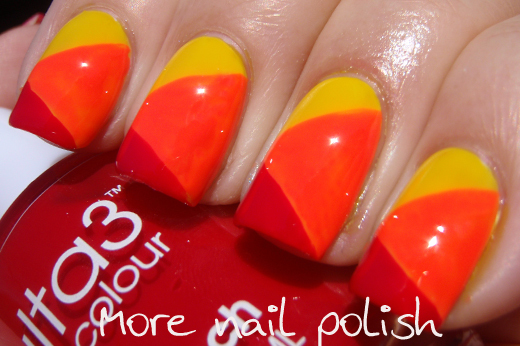 Start out by painting your nails with 2 coats of the lighest of your chosen shades. Pour a few drops of your chosen colours side by side onto the metal mixing plate. Pat the sponge onto the disk so that is picks up both colours and then pat it against your nails until you get the desired gradient effect." I chose to use my disposable makeup sponges, and I also didn't use the metal mixing plate. Instead I paint the two polish colours directly onto the sponge and then pat it onto the nail. Here is my finished look. The effect is very similar to the picture provided, although pale dahlia (which is the lightest colour) is much paler in my manicure than in the photos on the box. 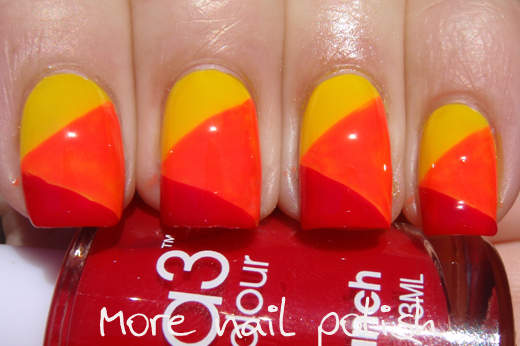 I decided to add one more gradient element to my manicure, using another polish from the box. I did a simple glitter gradient using twinkle toes. Onto tutorial number two - Tape manicure. Here is the tutorial provided on the box. "Tools required: Three shades nail polish, scotch tape. Shade used here: fresh squeezed, tangello twist and fruit punch. 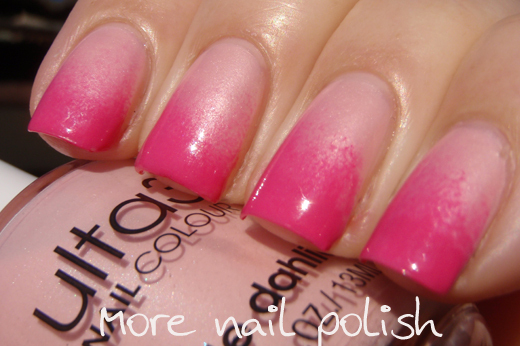 Paint your nals with 2 coats of the lightest shade, and wait for it to be dry completely. Place a piece of tape diagonally from middle of the finger nail to the tip. 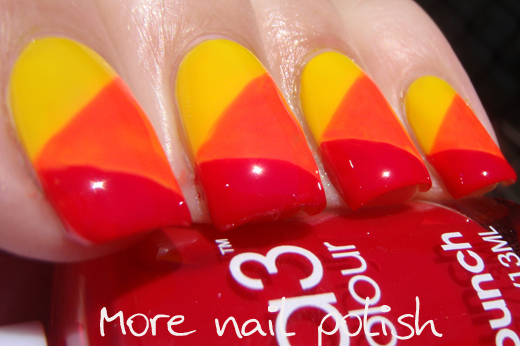 Paint the entire nail, including the tape, with the next lighest colour. Remove the tape immediately, before the nail polish dries. Once this layer is completely dry, place another piece of tape diagonally from the mddle of the nail to the base (in the opposite direction as the first piece). 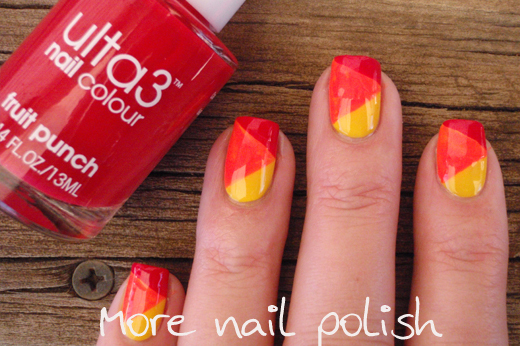 Paint the entire nail with the final colour and gently remove the tape." Ok, I'm not a patient person, so here is the truth as to what I did for this manicure. I didn't actually use scotch tape. I just painted my lines freehand using the nail art brush in the Ulta3 nail art tool kit. By doing it free hand it meant I didn't have to wait for it to be totally dry, it just had to be seche vite dry. This one looked very accurate to the pictures, although I have to say that the orange shade, tangello twist, is actually fluro orange - which doesn't show in either my photos or the box photos. Manicure number three - Dot manicure. Here is the tutorial provided on the box. "Tools required: 2 shades of nail polish, dotting tool (you can use a tool [sic] pick or flat-headed pin stuck into the eraser-head of a pencil). Shades used here: Black satin, lily white. Start with 2 coats of your lightest shade. 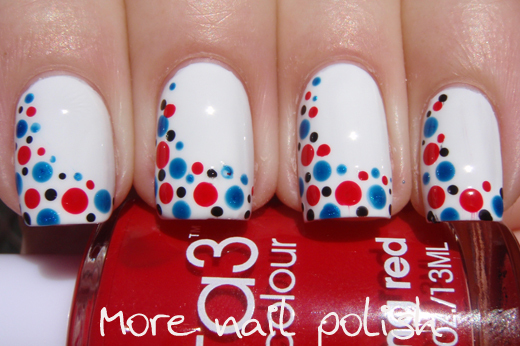 Once completely dry, dip the tip of your dotting tool into your second shade and begin dotting. You can randomly place the dots, or create any desired pattern." The design in the tutorial is a white base with black dots. I decided to make it a little more interesting and use all four polish colours provided on this row in the box. I used the double sided dotting tool from the ulta3 nail art tool kit and found it to work beautifully. You know what, I've never actually created a dotticure before!! I love them and think you might be seeing more of them! Ok, last turotial - glitter manicure. Here is the tutorial provided on the box. "Tools required: one shade of solid colour, one shade of glitter. Shade used here: silver grey, over the rainbow. Paint one to two coats of your solid colour. 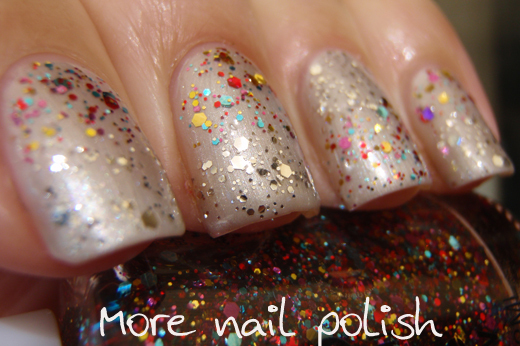 Once completely dry, coat with a layer of glitter. 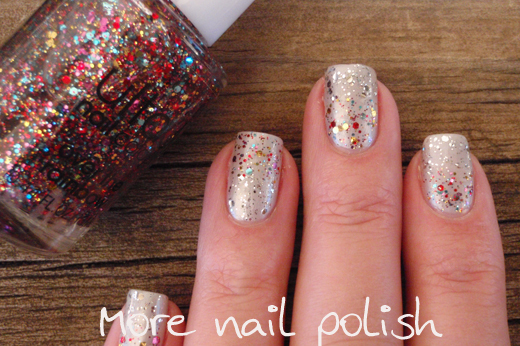 Repeat until you have the desired thickness of glitter." 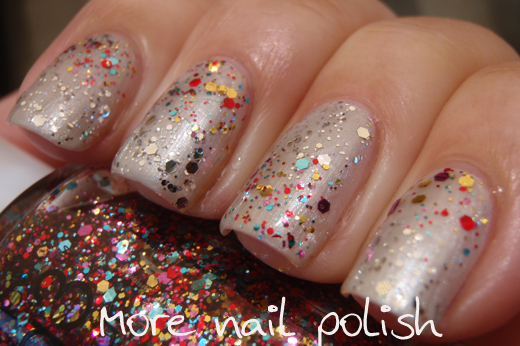 Right, so I'm not totally convinced that a glitter manicure actually counts as nail art, but here it is anyway. I tried to mix it up a little bit and instead of just doing a single glitter on the base colour, I did some two toned glitter with the silver glitter twinkle toes and over the rainbow. I also did the reverse direction of the glitter polishes on my ring finger. The Ulta3 Big Book of Nails is available now. Check the Ulta3 Stockist Locator to find your nearest stockist and ask any questions on the Ulta3 Facebook page. The book costs $21.95 and the nail art tool kit is $9.95. 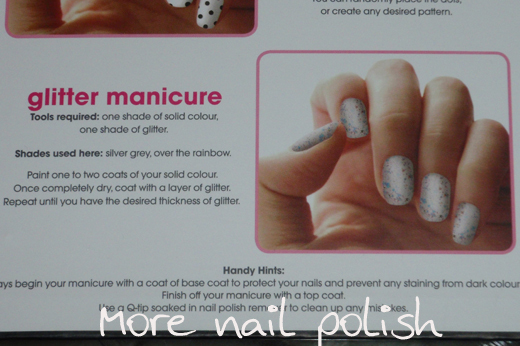 The book contains 16 polishes, so represents a saving of more than $10 compared to buying the polishes individually. These would make an awesome Christmas gift if you are the sort of person that likes to plan ahead. What an awesome idea! 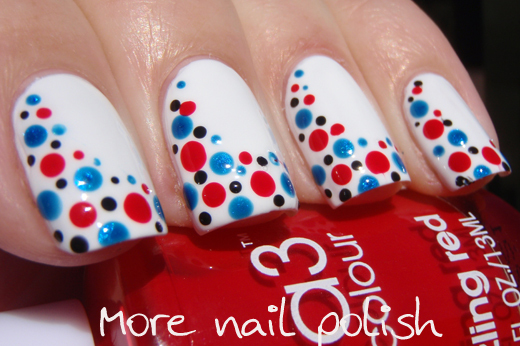 I love your version of the dotted manicure - fresh and eye catching not to mention very pretty. Such a cute and handy kit!!! Wonderful post!! Such a brilliant idea, love the look of the nail polish book! I love the idea of the 'book' - it would make a great gift for someone just getting interested in polish and nail art. 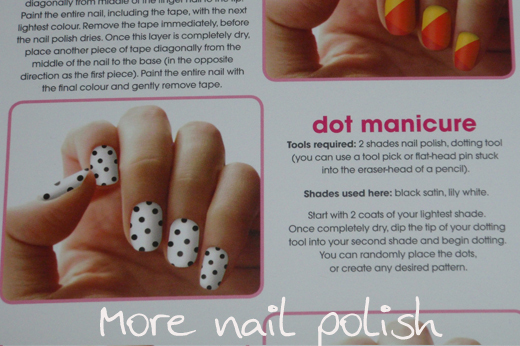 Also love your dot mani - dots are one of my favourite nail art techniques! I really want to get one of these kits, there looks to be a nice assortment of polishes.. 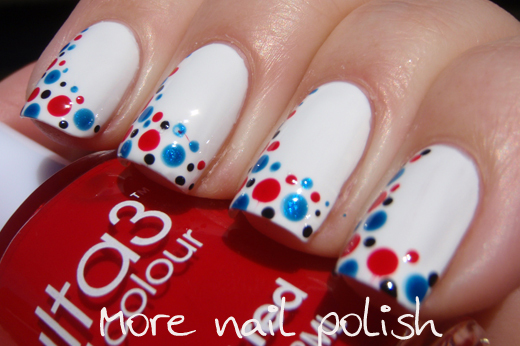 I love you dotticure! I have been VERY tempted to get the 'book' - every time I go to the shops I hear it whispering to me. Now I'm even more tempted! I love the looks you've done - especially the dotticure! this set looks so fun. i wish we got ulta3 in the states. Is there a website where I can buy Ulta3 products? I live in the US and can't seem to find them online. Any help would be appreciated. Thanks! You can now purchase them online from The Heat Group website, but I have no idea if they ship them internationally.